Kepco's 1000 watt instrument-grade digital power supplies, Series ATE-DMG, are linear low-noise power supplies designed to respond very quickly and precisely to voltage and current setting instructions delivered interactively by the GPIB (IEEE 488.2) or from a front panel keypad. 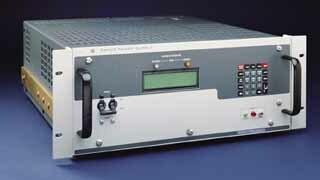 When programmed from the bus, the ATE-DMG power supplies respond to the SCPI (Standard Commands for Programmable Instruments) common language for instruments used in an automatic test system. Series ATE-DMG are derived from Kepco's Series ATE precision analog power supplies featuring ultra low noise and ultra low ripple at the output. A 24-key keypad augments the rotary voltage and current controls and a 2-line 16-character LCD display replaces the meters. The GPIB interface is built-in offering full talk-listen functionality on the bus. The display shows both the settings and the actual voltage and current readings which also can be read back on the bus, upon command. ATE are CE Marked per the Low Voltage Directive (LVD), EN61010-1 in accordance with the Conditions of Conformance.